Happy National Coffee Day! Today the Newton's Nook Design Team is hosting a blog hop to celebrate! You can visit all the Design Team Member's blogs and leave comments for a chance to win! You can also visit the Coffee Loving Cardmakers blog today for another big blog hop and a chance to win more prizes! I love the Cuppa Cactus Set so I paired it with some Fun papers from Doodlebug Designs for a Super Cute Coffee Card! I created an A2 size card base and then I added the papers which I die cut using the Frames and Flags Die set. I die cut the banner from some White and then I stamped the sentiment on it and adhered it with some foam tape. I stamped the Cactus images on some X-Press It Blending cardstock and then I colored them in with Copics. I used the coordinating dies to cut them out and then I added some White details with a gel pen. I adhered them to the banner with foam tape. I wanted a little more green so I added some Doodlebug Enamel Dots as well. So cute!!!! Would you like to win a $25 store credit to Newton's Nook Designs online shop? We will choose one lucky winner from our Hop! Comment on the NND blog and Design Team blogs (see list below)! The winner will be chosen at random from the collective reveal posts. Make sure to check out each of their blogs and comment for your chance to win. You will not know which blog has been chosen so the more you comment on the better your chances are of winning! You have until Sunday, September 30th at 9pm EST to comment. Winners will be announced on an NND blog post on Tuesday, October 2nd so please check back to see if you've won! What a cute card and I love the colors you used! What a perfect 'blend' of coffee and cactus! Brilliantly done! Such a cute & colorful card! Love it! Coffee cacti, I love it! Love the coffee and cactus papers! They work perfectly with this stamp set! So cute! this is super fun and super cute card! Oh, I have this set and I LOVE how you used it!!! I need to get it out again, thank you for the inspiration!!! Yeah for SW whimsy sentiment & look of this creation. I live in Central TX where it has been raining almost every day. Today it has been raining off & on. Good day for bee-ing (could not resist) inside for hop. Love your bright, cute card. Thanks for sharing. TOO CUTE! I love the papers and your design! Beautiful and bright and so cheerful! Love this. Fantastic Coffee Card! Love it! 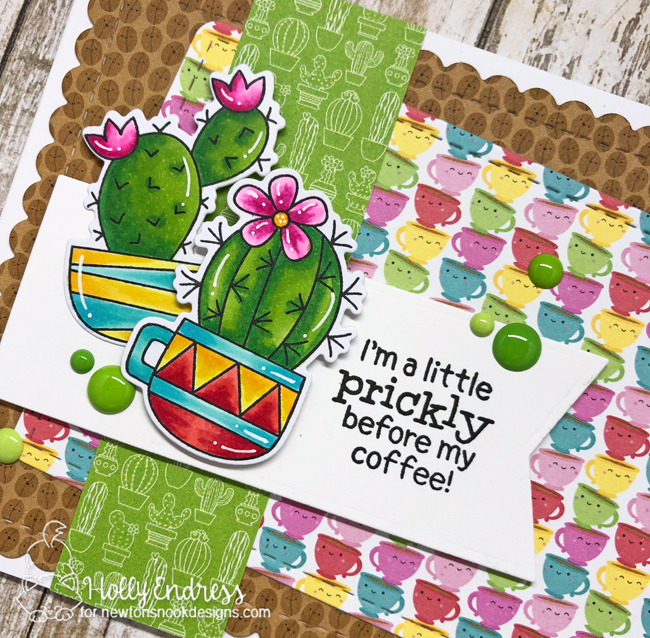 On my goodness Holly, I LOVE how you put this card together; and made it a prickly cactus card-----who needs coffee! Your greens are fantastic!! The papers are wonderful and they just all look so fab! What a wonderful inspiration and thank you so much for sharing!!! Fun card with a great mix of papers! Cute and fun card! Your coloring is fantastic. Such a fun coffee card! Holly, this is so fun! Love all the wonderful layers! This is a really fun and colorful coffee design! it's really original and I just love this sweet little cactus! Thanks for some awesome inspiration! So cute with the cacti and I like the papers. Cute card and love colors. Thanks for sharing. Oh my gosh this is soooooo adorable! all the beautiful bright colors and beautiful and cute patterned paper too! What a lovely card and you used some wonderfull papers as background..
Itimade me smile on this Sundaymorning Holly. I love your card. You see, I am also quite prickly without my morning coffee. In fact, I need it all day long or the prickles come out more than I'd like to admit. This is SO cute. 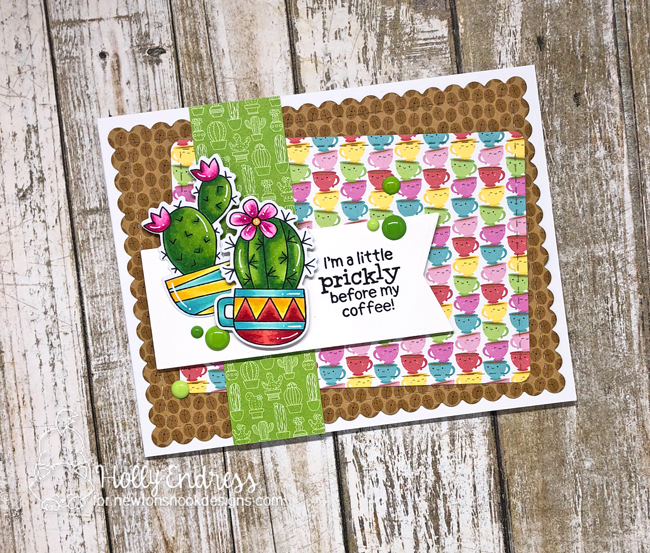 I just love those cacti paired with the fun patterned paper. Adorable! This is perfect! So bright and cheerful. So cute, love that set! Love this oh so pretty card!! Wonderful layers and beautiful coloring! Wow! Awesome card!!! Love the colors!!! Your card is really funny ! Yep me too. Such a wonderful card. Love the paper you added in the background.Thanks for the chance to win as I would love to add some Newton to my stamp collection. Cute cacti! I love your colors and paper, too. Love the cute cacti! ANd those background papers are so sweet! Thanks for the inspiration! Holds true with me too! What a very creative card! I love your card!! It’s so colorful!! I’ve never seen a cactus in a coffee cup and I think that’s really cool! Your coloring is spot on. Those papers are so fun and go perfectly with the cactus coffee! So fun!